Be Barefoot : Shaklee Master Rows to a New World Record at 86 yrs. Young! Shaklee Master Rows to a New World Record at 86 yrs. Young! 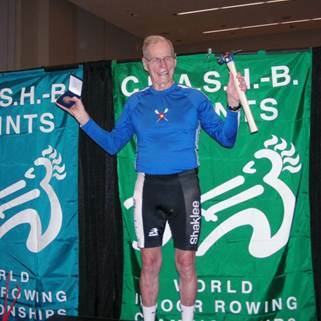 Dean Smith set new US and World records at the World Indoor Rowing Championship, hosted by the CRASH-B Sprints that took place on February 17, 2013 at the Agganis Arena in Boston. Over 2,200 athletes raced from more than a dozen countries, with competitors ranging in age from 14 to 95. Dean’s world record time in the 2000 meter row was 8:10.5. Just Google Dean Smith Rowing to see how he has been keeping active. Dean, a former world- class runner is used to being on the winner’s podium. Previously in Masters Track & Field he won World championship gold medals in Hanover, Germany and Gothenburg, Sweden for the 800 meter run, as well as several national championships. Bad knees brought an end to Dean’s running a few years ago, so he was delighted to find a new sport in which to compete. He joined the Rocky Mountain Rowing Club when he moved to Lone Tree, Colorado seven years ago. Since then he has won NINE World Championships in sculls on the water in Zagreb, Croatia, Vienna, Austria, Birmingham, England and Vilnius, Lithuania. Dean is a young 86. He attributes his edge for success to using Shaklee Sports Products.